Since 2003, an increasing number of people have been exposed to lower annual mean NO2 concentration. 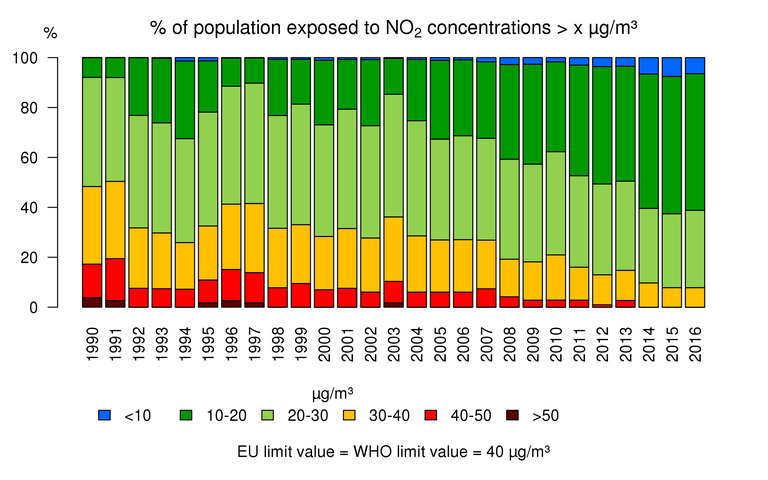 Since 1998, the percentage of the Belgian population that is potentially exposed to annual mean concentrations above the EU limit value fluctuated around 7%. In 2013, this percentage had dropped to 3% and, according to the calculations, no one was exposed since to annual mean concentrations above the EU limit value. The results however have to be interpreted with caution. Population exposure is estimated based on a spatial interpolation of measurements and the number of inhabitants per 4x4 km² grid cell. As stated previously, concentrations above or below the RIO-interpolated concentrations (which apply for 4x4 km²) can be measured locally. It is because of this, while the figure shows no exposure to increased concentrations (> 40 µg/m³), parts of the population were exposed to concentrations above 40 µg/m³ at locally. This happens mainly in the direct vicinity of measuring stations were exceedances were registered. Percentage of the Belgian population exposed to annual mean NO2 concentrations. All data were calculated based on the RIO interpolation technique.